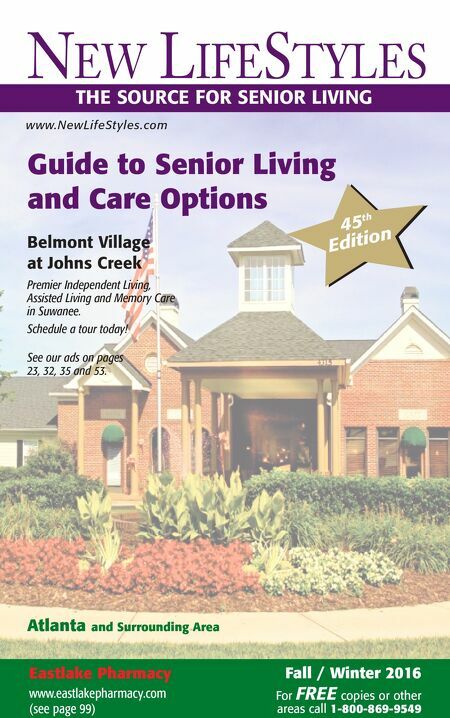 Fall / Winter 2016 For FREE copies or other areas call 1-800-869-9549 Atlanta and Surrounding Area www.NewLifeStyles.com Guide to Senior Living and Care Options Eastlake Pharmacy www.eastlakepharmacy.com (see page 99) 45 th Edition THE SOURCE FOR SENIOR LIVING Belmont Village at Johns Creek Premier Independent Living, Assisted Living and Memory Care in Suwanee. Schedule a tour today! See our ads on pages 23, 32, 35 and 53.